World Refugee Day is an important time for citizens across the globe to recognise the plight of refugees. On UNHCR’s website they say it as a day that ‘commemorates the strength, courage, and resilience of millions of refugees.’ This was shown through the coming together of the diverse groups within the camp to attend a small event in Karenni Refugee Camp 1. World Refugee Day was first celebrated on the 20th June 2001. This was to mark the 50th anniversary of the 1951 Convention relating to the status of refugees. It also coincided with the more widespread Africa Refugee Day. In 2001, the United Nations High Commissioner for Refugees stated this day would be used to recognise the plight of the approximately 14 million refugees in the world. With the global refugee situation in mind, it is important to get a scope of the current refugee crisis within the world. At this moment, more than 43 million people are forcibly displaced across the world. The number has almost tripled since the introduction of world refugee day in 2001. The UNHCR uses this event as an opportunity to raise the wider public’s awareness of refugee crises across the world. Last year, in order to raise awareness of the people in Karenni Refugee Camp 1, the UNHCR’s special envoy, Angelina Jolie-Pitt traveled to the camp and met with the citizens there. This year’s event in Karenni Refugee Camp 1 did not include such a high profile presence. 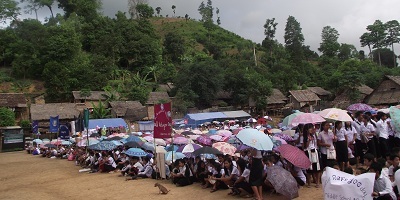 At the 2015 event in Karenni Refugee Camp 1, there were speeches by the leaders of UNHCR, Thai authorities and NGOs. After the speeches, there was dancing and singing. There was also some sports and games for the refugee people to participate in. Furthermore, some of the NGOs displayed their activities and information about their program during the day. Organisations such as ACTED displayed the materials and food produced in their workshops. This event and day is very important for people to learn more about our refugee people and be able to consider about our lives and situation. So that, People can unite to support refugees across the world.